Prices valid from 1st April - 31st May 2019. Stocks are strictly limited, offers available while stocks last. T&C’s apply to bonus redemptions. The only tool brand that gives you 1440W of power from a single Multi Volt battery. Entry forms are located in store at your local ITM branch. Tâ&#x20AC;&#x2122;s and Câ&#x20AC;&#x2122;s apply. Terms and conditions: Purchase specially marked Paslode FrameMaster kits to receive free 1 x Product Nail Guide and 1 x No Mar Tip included in the tool case contents. This giveaway is only available through ITM stores for a limited time and only while stocks last. See instore for more details. thin metal and into timber. One of these three Augers is given FREE with every PHB35 purchase! Exclusive to ITM. Promotion period 1st April – 31st May 2019. PLUS YOU GO INTO THE DRAW TO WIN 1 OF 4 UE MEGA BOOMS! Terms and conditions: Spend $150 (ex GST) in one transaction on any of the listed products. Go online to Sika.co.nz, complete your details, provide proof of purchase and Sika will send you a Sika Trade Gun. Proof of purchase (receipt) must be supplied. Every online redemption will also automatically go in the draw to win 1 of 4 UE Mega Booms. One entry and Sika Trade Gun per transaction. Full terms and conditions at www.sika.co.nz. 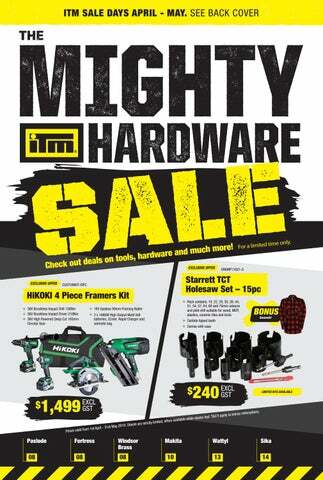 Mighty ITM Hardware Sale terms and conditions. All prices exclude GST. Prices and bonuses are valid from 1st April to 31st May 2019 unless specified otherwise. Stocks are strictly limited and offers available while stocks last. Some products may not be available in all ITM stores, but can be ordered if stock is available. Mighty ITM Hardware Sale bonus items redemption terms and conditions. To redeem your bonus item on valid purchases made at the Mighty ITM Hardware Sale the following redemption mechanics apply: Bonus via redemption: To redeem bonus offers via redemption simply visit www.itm.co.nz/mightysale, and follow the appropriate supplier links to complete your bonus redemption. You will be required to upload a copy of your tax invoice (showing invoice number, invoice date, payment in full, the model number and store of purchase) and click the submit button. Redemption period valid 1st April to 14th June 2019, supplier Terms & Conditions apply. For further assistance please contact your local ITM store. Bonus items: All other bonus items are supplied at time of purchase. 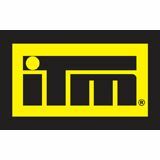 SALE DAYS AT YOUR LOCAL ITM DURING APRIL - MAY! Additional savings, plus food and giveaways available on the day. Check out the deals on tools, hardware and much more!